The species is widespread in much of England and parts of Wales. It is also recorded from the Isle of Skye (Merrett 1989) and Midlothian (Merrett 2000). S. pubescens is widespread in western and central Europe. S. pubescens is usually found in association with human habitation, on walls, window frames, fences and sometimes indoors but tending to prefer outdoor situations in full sunshine. It is occasionally found on fence posts, tree trunks, underneath stones and on heather away from houses and other buildings (Roberts 1995; Crocker & Daws 1996). Mature females can be found throughout the year and males have been recorded between March and October, but adults of both sexes are found mainly in May and June. The spider is locally dispersed throughout its range. 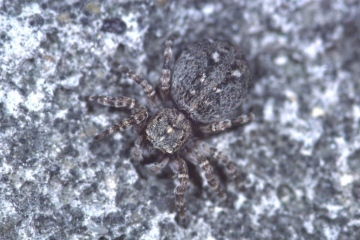 A marked decline associated with an increase in Euophrys lanigera is pointed out in Merrett (1979) and a marked decline nationally since the early 1970s is also noted in Crocker & Daws (1996).